Hunting for food is awesome. Hunting with a spear is the ultimate awesome. Going back to the dawn of time, in pre-history, when we walked about naked until we found a woolly mammoth to kill, humans use spears to kill their prey. In fact, spears have been around for over 80,000 years, dating back to pre-homo sapiens. But today, if you have the best bear can for bear hunting or deer feeders to hunt the deer down, all you need is just to be in the right place with appropriate equipment (like the bow or the rifle). You can use a spear to kill any size of game as well as fish and birds, although the latter two require an extreme skill set and expert technique. Fact: the larger the target, the harder to kill with a spear. Sure, its head on, its big, but if you don’t get that kill shot, you will need to jab and jab again. Now that might sound awesome in a Hollywood movie, but believe you me, you don’t want an angry wild boar weighing 900 lbs., discussing terms of your demise. As the saying goes; a good carpenter doesn’t blame his tools, so too a good hunter. However, there are great tools to choose from, and this is where I come in. With over twenty years of successful and legal game hunting, I am going to review my preferred spears and partake of my personal experience and knowledge for your benefit. As Morgan Freeman said to “Lucy” “Pass it on,” that’s the truth right there. In theory, you can hunt anything with a spear, in practice, you won’t want to. Sure, you can go after raccoon, rabbit, deer, elk, and boar, but how about a bear and a buffalo? It’s time to stop dickering about the subject and jump right in. If you want to learn all about hunting with a spear, I have added large hunting with spears 101 section at the base of this article. So, after you read up on each spear, and have the time, take a quick look at the article. 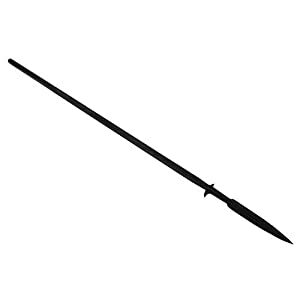 The Assegai Long Shaft spear is a very long 6-foot 9 1/2 inches spear. The spears head is made of SK-5 mild carbon steel and is 13 1/3” long. The shaft is made of American Ash wood. Take note; these spears have a long waiting list; you could end up waiting a year to get yours if you order it directly from Cold Steel, that’s how popular they are. So, I suggest you buy one here, online where the wait is down to delivery time only. Let’s take a look at this long shaft. I bet you didn’t realize that the Long Shaft Assegai Spear is meant to be used for target practice rather than for actual hunting. In fact, the longer the shaft, the less usable the spear is for combat or hunting. While it is great for throwing, you need to be an experienced hunter, with years of trial and error behind you to successfully throw one of these on even a large animal. This spear was designed to help the holder gain experience in long-distance accuracy, as well as practice stabbing skills. Stabbing is the ultimate purpose f a spear, and hunting animals requires you to get up close for that kill stab. 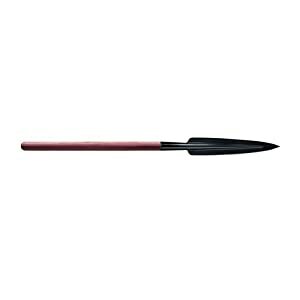 This Long Shaft Assegai Spear is great for a safe distance stab of large game, keeping you away from an injured wild animal is exactly what you need. The most experienced hunters will always warn you of the dangers of an injured animal. The Long Shaft Assegai Spearhead weighs in at 12.8 oz. Moreover, the whole unit (shaft and spearhead) weighs 43.2 oz. The spearhead thickness metal is 2mm 2 1/2″ made of SK-5 Medium Carbon that will flexibly bend rather than break up impact. The shaft is made of strong, resilient American Ash, and the whole unit comes with a Cold Steels leather Secure-Ex® Sheath for safety when not in use. Bottom line: Cold Steels’ Long Shaft Assegai Spear is great on the wall, in your hands for throwing practice, and in your hands when trying to stab a medium to the large animal for that kill shot from a safe distance. The large spearheads tensile strength and sharpness make it slice through all meats with ease. This is a great throwing spear that can be used as a walking stick too. Its length detracts from its stabbing performance due to maneuverability. You need to be experienced to handle a really long spear. You cannot carry it on a backpack; you need to hold it at all times. This is the Cold Steel Assegai Short Spear, which in my opinion is the best spear around for general hunting purposes as well as for combat usage. This short spear is a great weapon for use when hunting deer, coyote, raccoon rabbit and hogs, and many more wild animals. It is a great throwing spear as well as a highly effective and manageable stabbing spear. In fact, its 38” length and lightness make this an excellent stabbing spear. Its length is perfect for handling, and any adept hunter with basic experience will find using this spear beneficial for both improving skills and personal performance. This version comes with a 38” American Ash shaft and a 13-1/3” long, 2mm and 2-1/2” wide head blade. The blade is made out of tempered SK5 medium carbon steel that will bend and not break upon heavy impact. The spears light weight is perhaps its greatest advantage, it only weighs 1.7 lbs., making this a truly deadly weapon in the right hands, and an extremely portable one for long hunts. Did you know that this Assegai short spear can take on even the largest of the game? Well, the secret is in weight, balance, and skill, if you have a perfect weapon, you will be able to wield it perfectly. This weapon is designed by professionals for professionals. I can promise you, that this is the weapon of choice for the best hunters around the world. The Short Shaft Assegai Spearhead weighs in at 12.8 oz., and the whole unit (shaft and spearhead) weighs 27.2 oz. Short, lightweight and easy to carry. You cannot hike with it as a walking stick. All hunters with experience do not rely on one weapon alone. Modern hunting and access to many weapons allow us to own and use weapons of preference that are focused on specific requirements. The same goes for spears. 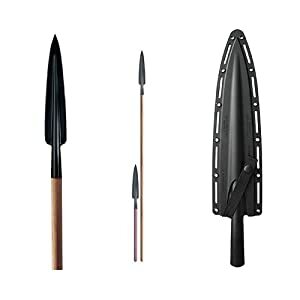 Just like any other tool, spears come in a variety of designs, and the United Cutler’s M48 Talon Survival Spear is a great design for multi-purpose hunting. Did you know that this spear has a close quarter stabbing handle? Well, I will let you into a hunting world secret, when stabbing a dying animal at close quarters you want to make sure the action is hard and swift to put the game out of its misery and pain. United Cutler’s M48 Talon Survival Spear comes with a formed stabbing handle close to the spearhead that gives you that extra accurate stab. This spear is a small compact unit fit for survivalists that want a good hinting and fishing spear combo. The same stabbing handle can be used to wield the spear as a knife if you find yourself with just the spear as your cutting tool. The shaft is a 30% fiberglass Nylon composite material, making it extremely light for its 44 1/8″ length, which is just under 4 feet, and the spearhead is 8” long and ½” thick. 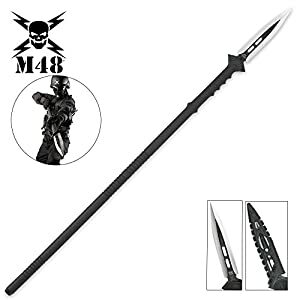 This is a really great spear for close kill quarters; it is light and versatile, so you don’t tire from handling it over long periods. It is a compact spear, and light enough to be carried on a backpack, although it’s too short for a walking stick. Even though the M48 Talon Survival Spear is light, it is a formidable tool when hunting for larger game such as buffalo, deer, hogs, and coyote, and is obviously well suited for smaller game and fishing. It’s time to talk action; this is the ultimate spear. The Cold Steel Boar Spear that is both sturdy, maneuverable, and powerful enough to stop a wild boar, even when injured. The Cold Steel Boar Spears head is a whopping 18-1/2” long and is a solid 3/32” thick. The spearhead is made of a forged medium carbon steel that assures you of bending and not breaking when handling hard impacts. 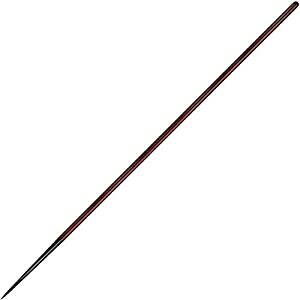 The shaft length is a very safe 82-1/2”, which is about 6’ 10” long, making this a perfect distance stabbing spear as well as a great walking stick for those long hints. With all this size and power, its amazing that it weighs in at only 4.25 lbs., this is due to the Cold Steel shaft material of choice, American Ash. Did you know that the official American Baseball League bats are made of American Ash? That’s how reliable, strong and sturdy this natural material is. When you decide to go boar hunting, and you are facing one wild and angry boar, you better come prepared. This is the best solution; it will replace any hand-held hunting knife with ease and provides a perfect kill jab safety distance ratio. This is also great for throwing; its extra length and lightness can be manipulated into an Olympic javelin shot in the hands of an experienced hunter thrower. Cold Steel Boar Spears head spear weighs in at 20 oz. and the whole unit (shaft and spearhead) weighs 68 oz. The spearhead is a whopping 18 ½” long and 3/32” width SK5 steel that bends rather then breaks, and it weighs 4 ¼ lbs. Look, the length of this spearhead is bloody long, there is no other way of describing it. The overall length of this spear is 89”. The shaft is 71″ X 1 1/2” made of strong, resilient American Ash, and the whole unit comes with a Cold Steels leather Secure-Ex® Sheath for safety when not in use. You cannot carry it on a backpack; you need to hold it always. If its simplicity you want, then its simplicity you will get. This is the Cold Steel Lance, a design that has not changed for centuries. It is a surgical needle made big. This lance is designed for distance stabbing as well as Olympic throwing. Aerodynamic, it will pierce even the toughest and smallest of hides as if they were made of butter. This is a perfectly straight 6’8” long killing machine and perfect hunting walking stick. It’s made of ultra-tough and resilient 1055 carbon steel. The design is really simple, it’s an overall 80” long spear, with an American Ash wood shaft that is 64” leading to a conical tapered 16” spearhead that weights 12.2 oz. The overall weight of this beauty is only 42.6 oz. There isn’t too much to write about, its long, effective and useful for killing snakes. It is a great fishing spear, and it can be used for first throw attacks when distance and accuracy are required to slow down a larger animal. The spearhead design is aimed for quick penetration and release. You need to be experienced to handle a long spear. Hunting secret revealed: Spears are one of man’s longest serving weapons dating back to pre-history. Spears were designed to provide a safe distance of attack; they were also designed for throwing at larger animals, such as mammoth and then coming in for a close quarter kill, but with enough distance to keep the hunter safe. Spears can be made of any material you like, ranging from wood to metal, bone to synthetics. Any combination works., all you really need is the knowledge and experience in wielding a spear professionally. Today, spears are less sought after than the more conventional modern methods of killing, such as guns. However, when you live in a restricted gun area, or if you want a weapon that you can use again and again without worrying about relocating and exhaustive maintenance, a spear is your best weapon of choice. It is also silent as well as deadly. Hunting is a human activity. Whether we hunt for game, for people or resources, we are constantly hunting. In fact, we everyone hunts on a daily basis, this the way we survive. Today, most of society enjoys processed meats, which come from farmed animals and mass production processes. Some societies still practice personalized killing of animals for festivals and special occasions. Certain countries recognize the need to maintain wild animal levels and have regulated hunting seasons. In most cases, when an animal is not an endangered species, killing them in the wild for survival is also tolerated. A hunter is a person that will either go out into the wild, where they live as survivalists, to hunt for food or is a “Weekend” hunter that enjoys the adrenaline packed rush of hunting during hunting season time. Other hunters seeking more exotic animals will traverse the globe seeking out the big game and, on some occasions, local or state-sponsored hunts for dangerous animals that have killed a human, such as crocodiles. However, for most of us its that time of year to go hunting for hog or a wild boar, and if we are lucky a large Elk. Now I know I will sound offensive to vegans, but nothing beats a fresh sizzling piece of bloody and slated venison on a field barbeque or the smell of roasted hog on the spit. So, that is what hunting is and will remain a modern activity. This doesn’t mean we need to use modern weapons to hunt. The use of a spear takes us back to the primordial days when we hunted in packs and tried to down a large beast to feed the tribe. One successful tribesman would be considered a hero (without superpowers and snazzy outfit) for bringing in food. Being experienced in the use of a spear, is, in my opinion, a must for any serious hunter. It’s not enough to know how to hunt with a knife, a gun or a long-distance rifle. Getting up close to smell the breath of the beast and look it in the eyes when you stab it with your short assegai spear, or long boar spear is where true talent lies. Being able to throw accurately is not in everyone’s ability, and that is why a spear is so versatile. It provides the bearer to stab and slash as well as throw. So now we come to the crux of the matter. How well do you know how to handle a spear? Can you throw accurately? Are you patient and fast enough to spear a fish? Can you stab with power passing skin, bone, and meat to get a clean kill stab? Not everyone can use the same spear with equal proficiency. Bottom line: choosing the right spear for you is all about how you feel with the spear. It’s not about the game you are hunting; it’s about how you hunt the game. How do you feel with the spear of choice, whether you are hunting large game or fish, you match the spear to your needs? You also match the spear to how you handle it, feel it. In fact, the idea that modern soldiers are taught is that their gun is their best friend, arose from spears. Your spear is your best friend when you are out there in the wild tracking game. The best spear is the one you can feel. You can throw it with accuracy and ease, you can stay with it quickly and efficiently, and you know how it manipulates in your hands and fingers. Now I don’t expect you to go to sleep with it, but when you are out there alone at night, keeping a familiar weapon close by is always a comforting experience. When you decide to buy a spear, take note of your height and the length of the spear. Also, take note of your arm strength and what manipulative fingers you have. Now don’t waste time, go choose one of the above best hunting spears, ever.